The pump is the heart of your pool’s filtration system; without it, your pool would lose its sparkle and soon turn green. Whether you're after a pump for a new pool, or a replacement pump for an existing pool, Waterco has a great range of energy-efficient models to choose from. Incorporating the latest technology to deliver the right combination of performance and energy savings, Waterco’s pumps are reliable and built to the highest standards. The job of your pump is to basically draw water through the filtration system so that the pool water is kept clean and is properly circulated. The pump is driven by an electric motor directly attached to the pump impeller. As the electric motor turns, it causes the impeller to turn, which then forces water to flow through the pump. The water flows into the hair/lint pot inlet (i.e. an in built ‘strainer’ that catches leaves and other large debris before they get sucked into the pump and clog its impeller), and through the basket assembly. The flow then enters the centre of the pump housing, goes through the impeller, into the diffuser, and out the pump discharge port and onwards to the pool filter where the water is filters before it is sanitised and/or heated. How big is your pool and what is the volume of water? How long do you need to circulate the water? Does the pool have ancillary equipment such as in floor cleaning systems, pressure pool cleaners or water features? What is the distance from pool to pump? What are its pipework characteristics? Is a suction cleaner used? 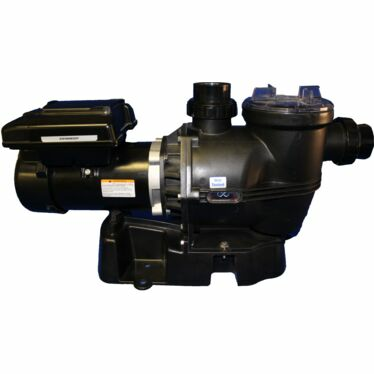 A variety of domestic pumps can be used for spas, above ground pools to large domestic in ground pools. Some models of domestic pumps are only suitable for smaller sized swimming pools, so check with an expert before purchasing and installing any pump system. Most domestic or commercial pumps are used for the purpose of recirculation, drawing water from the pool and pumping water through the filter. It is the filtration pump that normally operates the longest hours, with the average domestic pool pump running for around six to eight hours a day. Domestic pumps can be used in conjunction with pool ancillaries such as heating, in-floor cleaning, and water features. Ideal for commercial-sized swimming pools that require a high rate of circulation due to their large volume of water; designed to operate under very demanding conditions. These pumps have multiple speed settings, which enable the pump to be more efficient in its energy usage. Known as multiple or variable speed pumps, they can be set to different speeds according to how quickly you would like to pump water through the filter, thus saving energy and reducing running costs. Conventional pool pumps are limited to one set speed. A pool pump is usually sized to cater for the pool’s maximum water flow requirements, which may either be the sand filter’s backwash water flow or to provide sufficient water flow to operate a suction cleaner. As the speed of a conventional pump cannot be changed, the same maximum water flow is applied across the pool’s various requirements. As a pool’s filtration cycle occupies 99% of the run time of a pool pump, you can operate the energy saving multispeed pump on its low speed setting for a majority of its running time, leading to significant energy savings. Higher speeds can be triggered to provide adequate flow for ancillary equipment, such as providing sufficient flow of water to operate a suction cleaner.